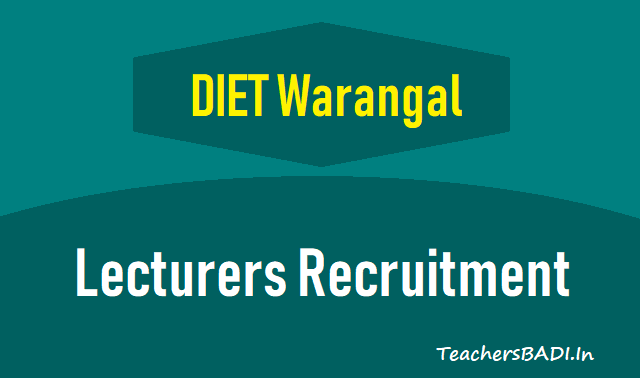 Warangal Govt DIET Lecturers Recruitment, Apply upto July 26, 2018, Hanamkonda Govt DIET Lecturers Recruitment, Govt DIET Guest Faculty Recruitment 2018 - Deadline for guest faculty applications in government diet is July 26: The DIET Principal Ravikumar said in a Press release on July 20 that the DIET Warangal invites applications from the eligible and interested candidates to serve as Guest lecturers at the Government DIET, Hanamkonda. Those who are interested in teaching Telugu, Urdu and English medium should submit their applications in DIET personally on July 26, 2018. 1. The retired teachers and hose who were conducted the teaching duties in DIETs are qualified. Foundation In Urdu, Science, Mathematics, Science, Telugu, Computer Education, Visual Forforming departments. The selected candidates have suggested to attend the DIET Hanamkonda with original certificates.